Leading Real Estate group gets a signature look. Bentley's Real Estate Group opened its premier office on Winter Street in the Port. The interiors highlight Bentley's signature colors- blues, tans and a pop of orange. The back wall is papered in Phillip Jefferies "The Knot" paying homage to Newburyport's coastal location. Oversize lantern light fixtures accentuate both the interior height and curve the architecture of the building as Merrimac Street to Winter Street intersect. 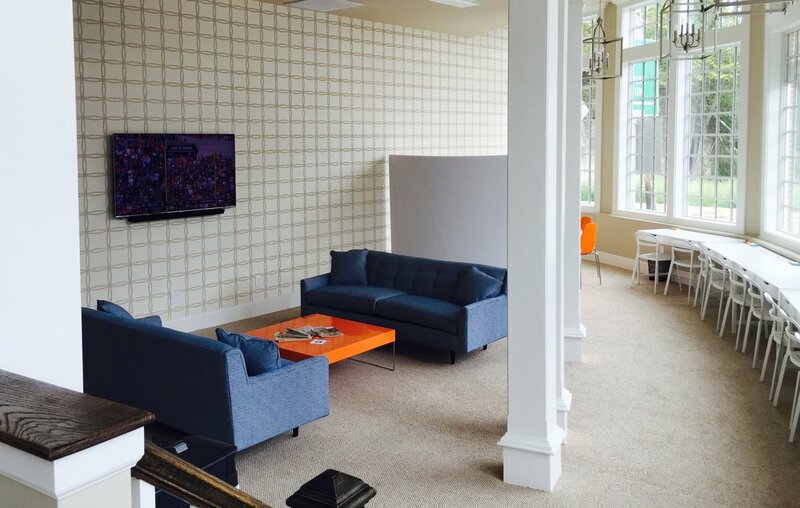 This is a hip office space with comfy blue sofas and hints of orange seating for lots of after hours gatherings. Agents sit along the curved wall with great light streaming in. Showing clients properties at either one of demilune shaped work areas equipped with large screens is inviting. Clients may also sit along side the agents at the window workstations also allowing for ease of use. Bentley's signature interiors will make finding your dream home just as relaxing.